I have been spending all the money lately and one of my favourite places to splash the cash is TK Maxx because they have some epic deals. Stupidly, I took all the labels off on the actual products so I can't tell you how much I saved. I know everything was under £10. So let's just jump into what I bought and see if I can give you some mini reviews as we go through everything as I have tried everything. Some items, like the Kale Clay Fix mask, only once so I will revisit them in future posts. Skin Food Nourishing Moisturiser (£10.96 - Amazon, £3 - TK Maxx) I really need a good moisturiser, why is it so hard for me to find one? 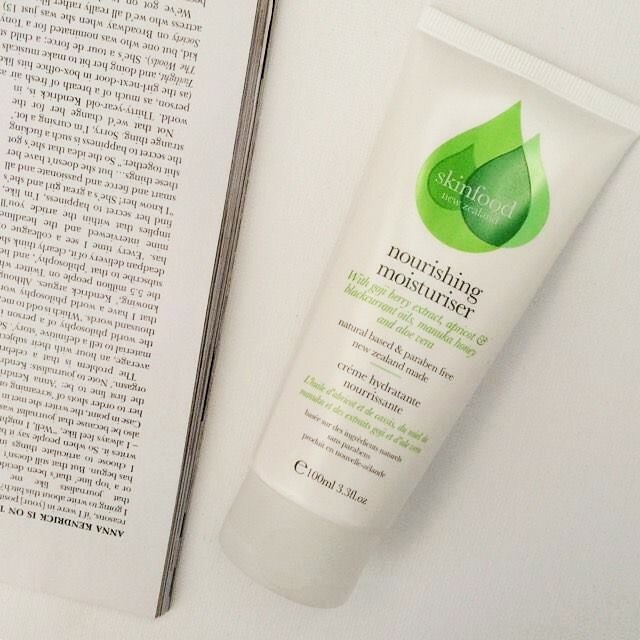 The term "nourishing" really speaks to me, I thought it would be lightweight and extremely hydrating but it is thick and feels like a Nivea hand cream. Do not recommend at all, sorry. I do love the name of the brand though, think it is really clever. Please leave your favourite moisturisers in the comments because I can't find one. 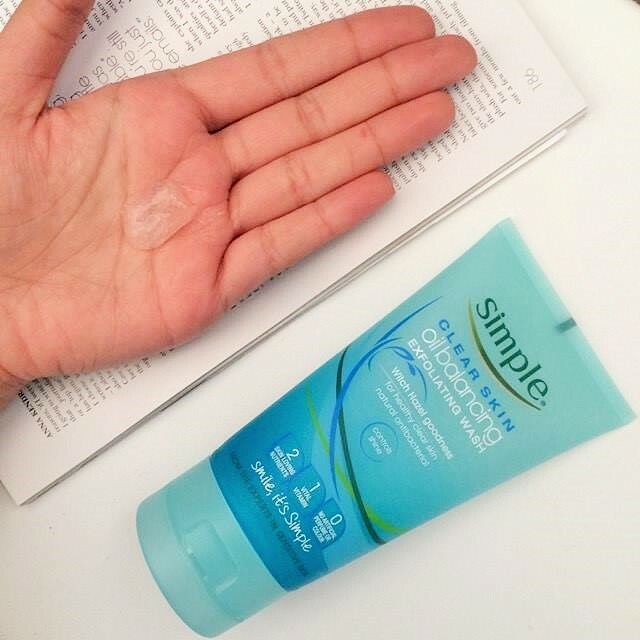 Simple Clear Skin Oil Balancing Exfoliating Face Wash (£3 - Tesco) I really love this face wash, it has a beady consistency which is super gentle on my skin and removes my makeup really well just on its own. I love the way this feels on my skin, it isn't drying at all and my face just feels smooth, fresh and clean after use. Great product. Nip + Fab Kale Fix Clay Mask (£13 - Nip + Fab, £8 - TK Maxx) As mentioned, I have only used this once which isn't enough time to form a solid opinion. So far, I don't hate it. It is for tired skin. I didn't notice a massive different after using it, but it is thin and lightweight with a nice healthy smell. It has some nice ingredients in it like Kaolin, Witch Hazel and Sweet Almond Oil but it also has fragrance (parfum) and a lot of chemical sounding ingredients. I prefer masks that are mostly natural to be honest, but that might just be me. I will try this a few more times and review properly in due course. Good Things Argan Oil Perfecting Face Oil (£7 - Boots, £4 - TK Maxx) Honestly, I purchased this because I needed a less expensive beauty oil to mix with my foundation. I have used it as a skincare item and find that this would be best for people with quite dry skin. My skin sometimes can become dry, usually due to a product on trial that pisses my skin right off, so I love having this on hand. It is not as luxurious as other oils I have used and hasn't wowed me, but it is good in a pinch and works fabulously mixed in with my foundation to make it look smooth and silky on my skin. Yes Gawd. Nivea In Shower Firming Moisturiser (£3.35 - Superdrug) I have tried the blue version of this before and it is running out, so I picked up a new one when I found that it was discounted. I joined a gym so anything firming is right up my street. It's very hydrating and I have been using it on and off for a few weeks now, I don't notice a lot of firming but that might come with time. 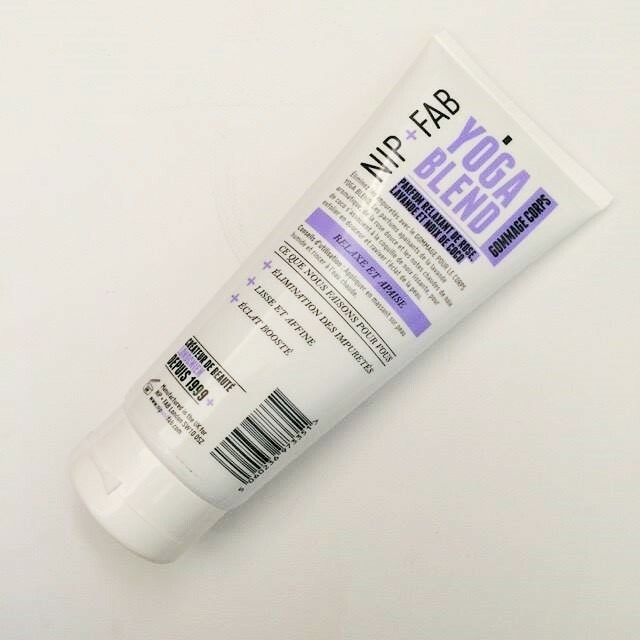 Nip + Fab Yoga Blend Body Scrub (£10 - Nip + Fab, £8 - TK Maxx) This is amazing after a sweaty gym session. So relaxing, I love the scent of lavender and find it refreshing yet calming at the same time. A great way to end the day, It's not too rough either, a great exfoliator that moisturises and smells like a gorgeous mix of lavender, coconut and rose. Love this, will definitely repurchase. Thank you so much for reading, I really appreciate all the love and each and every comment I receive makes me smile like a lunatic, so please leave one if you have a minute and follow me on Bloglovin'. 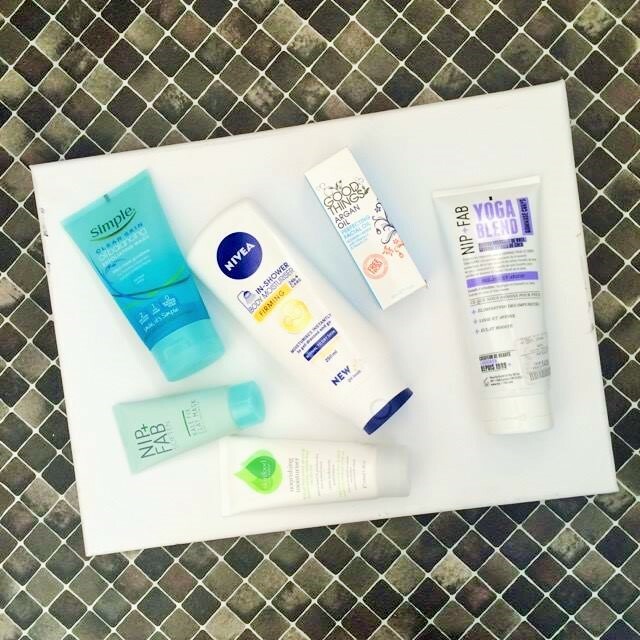 I love trying out new skincare so share your favourites below and let me know if you have tried any of these products. Hope you have had a great week and a beautiful weekend ahead. Take care. Love this quick review, the body scrub is something I'm keeping my eye on the scent sounds so lovely! Never thought of TK Max for skincare, just clothes and handbags so this is very handy! I love the beauty selection at TJ Maxx! You can always score a great find! I have never tried an in shower moisture cream, but we have this brand in The States so I will have to try this. And I had no idea they had TJ Maxx there. Good to know. I love that Nip+Fab face mask! It doesn't seems like it's doing anything at all but with continuous use, my skin became noticeably clearer and softer. Yoga Blend Body Scrub sounds like something I need to pick for after work-out pamper, lavender is the most relaxing scent ever. I bought so many lipsticks lately, I need to stop now :) I didn't know that Good Things had a face oil, I tried their face masks and they were great! TKmaxx is so great for finding bargains! Kale & Clay sounds like an amazing mix, looking forward to hearing more of your thoughts once you've tried it more. This post has me itching to check out my local one for some bargains! 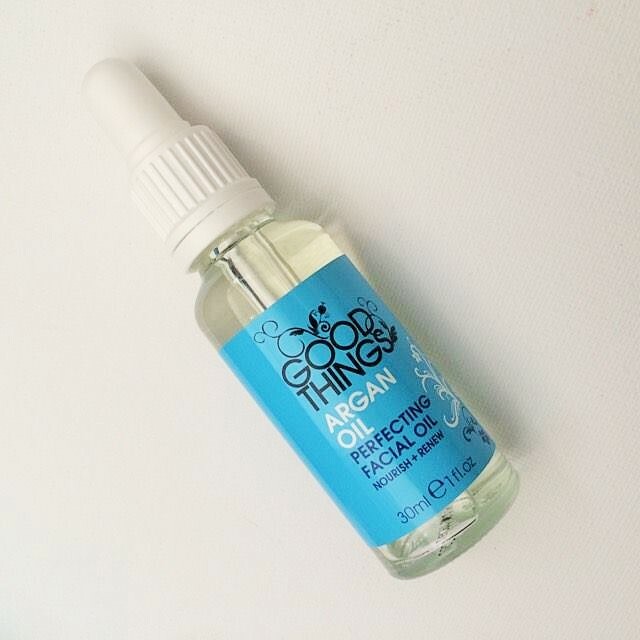 I've been contemplating using argan oil for my skincare - good to read a quick review about it. Definitely not something to use in the summer, but it would be a good product to use in the autumn/winter. I've heard from good things about nip and fab - but have not tried the brand yet! I've been looking for an inexpensive beauty oil to mix in with my foundation forever now! I'll have to have a look for this one! You can find some great bargains in TK Maxx. I got some amazing hair products from there, at least 50% cheaper than everywhere else. That face oil sounds pretty good, I`ll see if I can spot it in store. I love TJ Maxx in the U.S. I don't ever buy clothes I always buy beauty products. They have super cheap Alba Cosmetics + the Body Shop products. The Nip + Fab product sounds so great, I wonder if I can find it here in the U.S. 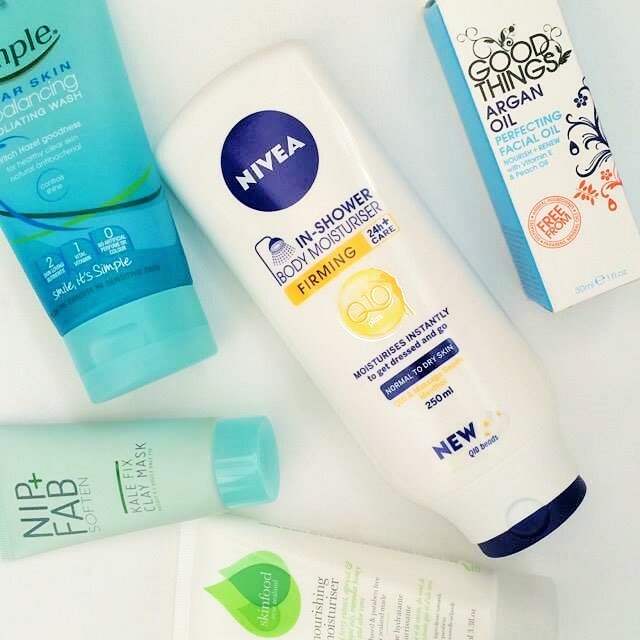 I really want to try Nivea's in shower body wash, thanks for sharing! TK maxx is fantastic for finding exciting products stashed away. Nip Fab is still a brand I've never tried. I have the Kale Fix mask and i don't reach for it often. I think i shall try that more to see visible results myself. I recommend trying Vichy Aqualia thermal cream or Clinique dramatically different moisturising GEL. I have the cream version which is quite thick but i have tried Gel which is so amazing. It gets absorbed so quickly without leavng ur skin sticky. I highly recommend checking that out. It's mad some of the things you can find in TK Maxx you can get some really good bargains! I haven't tried any of these products, but Nivea has always been one of my favorite brands, so this in-shower moisturizer is definitely a must-try! ♥ Also, I've heard a lot of good things about it. :) Hope to hear from you soon!